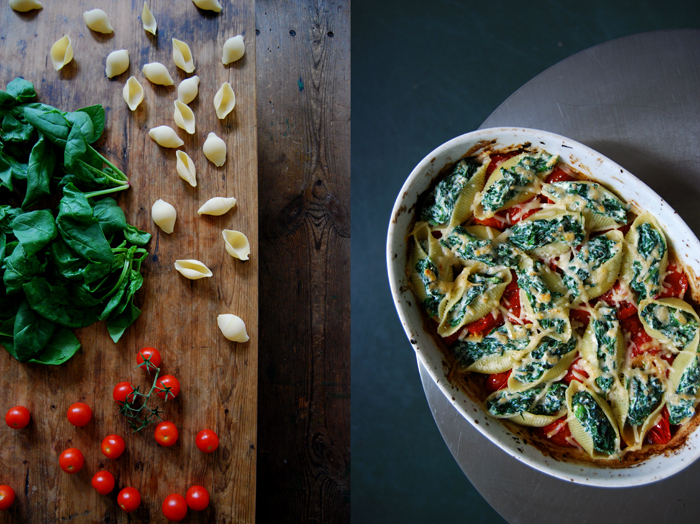 The trilogy of spinach, ricotta and tomatoes is one I use a lot for my pasta dishes, be it in lasagna, ravioli or canneloni. 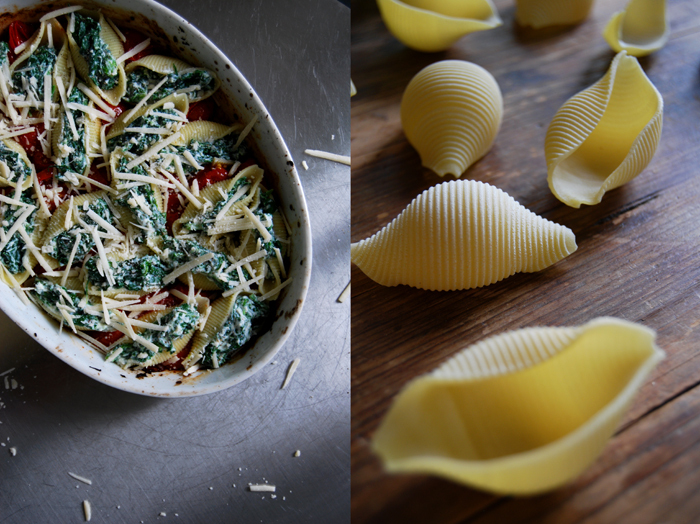 And if I need a really quick dinner I go for conchiglioni, the pretty pasta shells. It’s so convenient to stuff these little beauties with all kinds of sauces and vegetables, a thick Bolognese or Ratatouille, mashed pumpkin or a tuna stew, they deliciously carry whatever I choose to fill them with! I also like that I can cook them in advance and just bake them with some cheese under the grill to warm them up, another easy solution for a spontaneous dinner party! For this recipe I can skip all of the preparations that my classic lasagna requires, no Béchamel, no slow cooked red or meat sauce. I just put a bunch of cherry tomatoes under the grill until their skin starts to burst, it’s the same preparation that I used for my orecchiette recipe in July. The roasted fruits are so soft and sweet that I only need to stir in some olive oil, Balsamico vinegar, salt and pepper to turn them into an aromatic and juicy sauce. 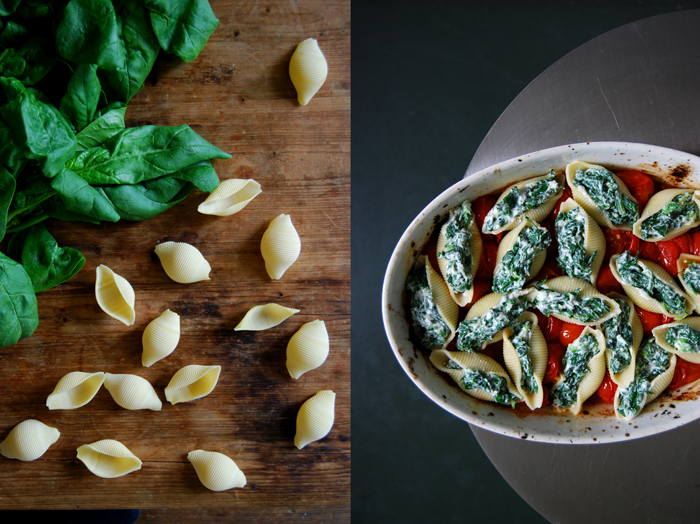 I spread the conchiglioni on top of the tomatoes in the same dish as soon as they are done, lusciously stuffed with blanched spinach and creamy ricotta and sprinkled with Parmesan. Another 3 minutes under the grill and dinner is served! In a large pot, bring salted water to the boil. 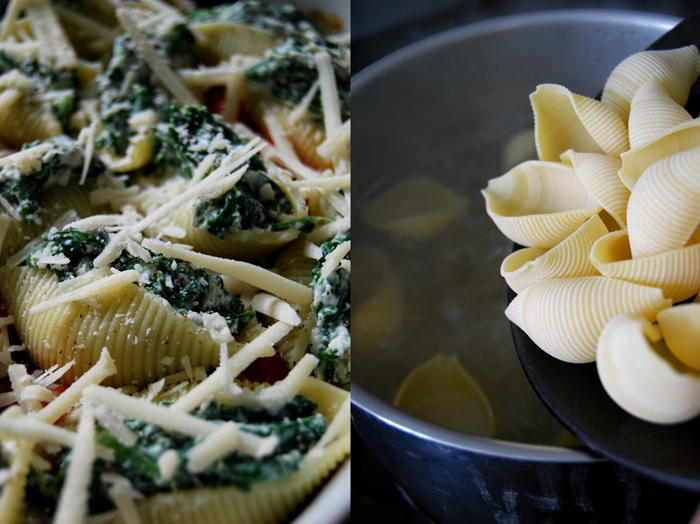 Blanche the spinach for 1 minute, rinse with cold water in a colander, drain and squeeze out the water with a spoon. 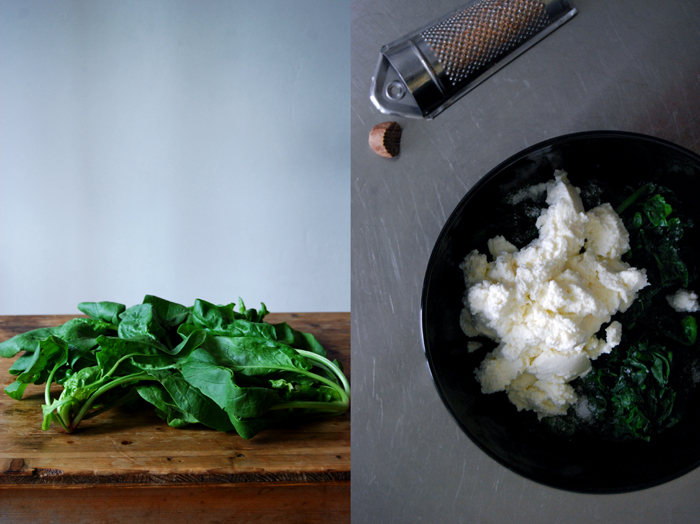 Chop the spinach roughly, mix with the ricotta and season with salt, pepper and nutmeg to taste. Put the cherry tomatoes in a baking dish (big enough to spread the stuffed conchiglioni on top when the tomatoes are done) and roast the fruits under the grill for 15 minutes or until their skin starts to burst, turn them once or twice. When the tomatoes are done, stir in the Balsamico vinegar and olive oil, season with salt and pepper and gently squeeze the tomatoes with a spoon. 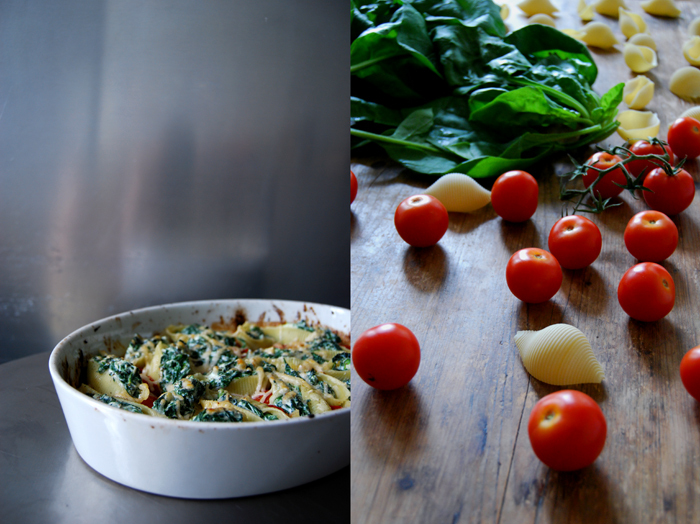 Fill the pasta shells with the spinach ricotta stuffing, spread them on top of the tomatoes and push them gently in between the tomatoes. Sprinkle the shells with the Parmesan and some more pepper and put under the grill for around 3 minutes or until the cheese is melted and golden brown. 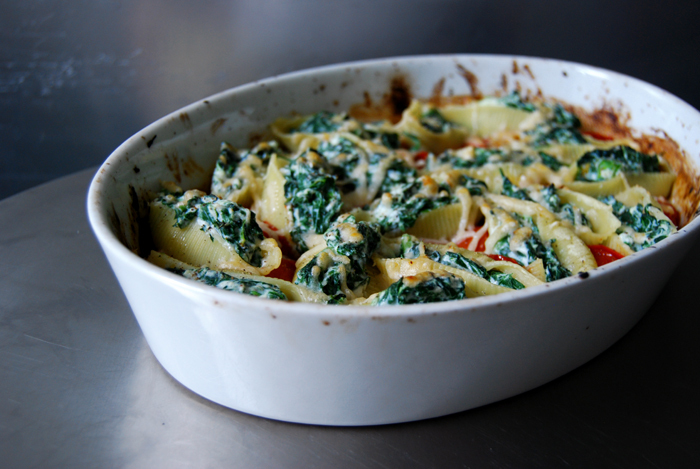 Like with lasagna, it’s best to let the dish sit for a few minutes before serving. Yes, I like their pretty shape, so easy to stuff with so many delicious fillings!